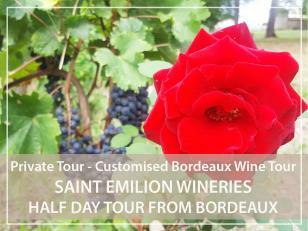 Private half-day tour: Discover the village Saint-Emilion and surrounding vineyards and wineries from Bordeaux centre! Pick-up of your group in Bordeaux centre (your hotel or meeting place previously fixed) at the beginning of the afternoon around 13h00 - Commented transfer to Saint-Emilion. During this half-day discovery tour of Saint-Emilion, we will schedule two wine tasting visits to wineries to discover the great characteristics of this world-famous wine. You will appreciate the great characteristics of Bordeaux wines, which are above all blended wines. Here the blended red wines are largely dominated by merlot which gives them the elegance of Saint-Emilion wines. The order of the visits may be reversed depending on the availability of the partners. At the end of the day (around 6:30 pm), transfer back to Bordeaux for an arrival around 7:30 pm.